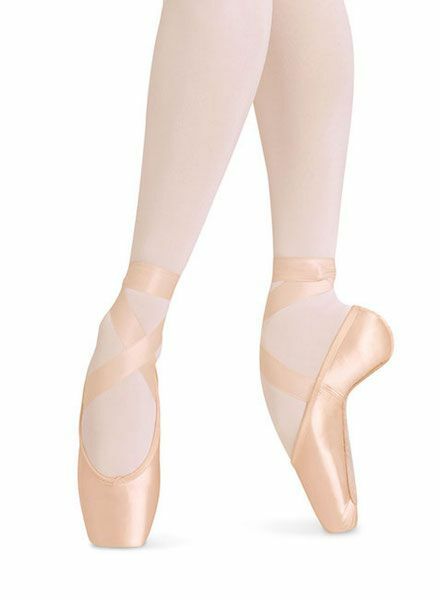 The European Balance pointe shoe is created on a curved last, creating a comfortable fit forming to the dancer's arch. This shoe has a low profile and an open throat line that help to make it feel like the shoe is hugging the foot. It has a diagonal side seam that reduces satin creasing, and heel reinforcement, which visually adheres to the curves of the heel. The broad platform helps with weight distribution and can reduce pressure on the metatarsals. There is a sound reducer pad - a thin foam pad - in the tip of the box.